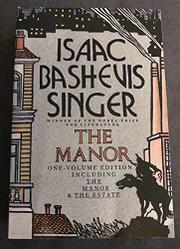 Isaac Singer's novel, set in Poland during the latter half of the 19th century, is a sprawling family history--the fates of Calman Jacoby, rural Jewish businessman, and his four daughters (or rather the destinies determined through their marriages). The oldest, Jochebed, marries a stuffy man who eventually takes over Calman's business; Shaindel marries a bright man who will be a doctor and eventually take a mistress because Shaindel stays ignorant and becomes fat; Miriam Lieba runs away with a worthless Gentile and endures grinding poverty; Tsipele is married off to a serious young man who unwillingly becomes a Hassidic leader. Then there's Calman's second marriage, an unhappy one.... Through these sporadically developed domestic dramas are seen the backwardness of Polish life at that time, the erratic politics, the conflict of old Jewish life and modern thought. Singer has his readership which will not find that the heavily descriptive Jewish lore slows the narrative or a natural curiosity in its outcome.